Cowboy Joe West sat out Tuesday, a day after MLB's senior umpire took a fastball directly to the knee in Detroit. 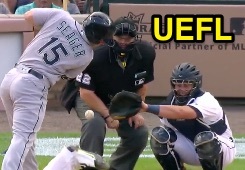 On Monday, West took a 93-mph fastball from Tigers pitcher Mike Pelfrey off his right knee; it was a direct shot, as replays indicate that neither catcher James McCann nor batter Kyle Seager deflected the pitched ball. West remained in the game, finishing Monday's contest alongside Mark Ripperger (1B), Kerwin Danley (2B) and Andy Fletcher (3B). On Tuesday, MiLB call-up umpire Ben May filled in for West, working the third base position alongside plate umpire Ripperger, acting crew chief Danley (1B) and Fletcher (2B).